The unconventional marriage of playoff baseball fever and music artistry go hand-in-hand in Pearl Jam: Let’s Play Two, an excitable and sentimental documentary that chronicles Pearl Jam gleefully situated in the middle of the hysteria surrounding the Chicago Cubs 2016 dream season which saw the team overcome a century-old dry-spell and win the World Series. The film is a lyrical love letter from Pearl Jam frontman Eddie Vedder as he and his band-mates perform an eye-popping concert before massive crowds at Wrigley Stadium in August 2016 in anticipation. With each frame, director/photographer Danny Clinch (even his surname suggests an aptly appropriate reference for the hardball junkies) conveys the intense and relished relationships that exist between Vedder/Pearl Jam and the Cubs and their devout musical groupies, The Cubs and their baseball loyalists, and even the competitive spirit of baseball versus the soothing sensation of Pearl Jam’s signature thought-provoking music. However, even though Pearl Jam: Let’s Play Two has its intoxicating moments, there is not much that is actually revealed or differently realized in Clinch’s celebratory narrative of Cubs community unity with Vedder at the forefront as the number one fan. Nonetheless, nothing will disappoint in Pearl Jam: Let’s Play Two if your heart bleeds for Chicago’s South Side baseball bombers or religiously follows the introspective swagger of Vedder and his musical mates. Clinch’s concert film blends baseball and music as a soulful connection as each entity displays the hungered expressiveness and indescribable emotion that its separate fans enthusiastically embrace. Interestingly, Vedder — a native Chicagoan and lifelong Cubs worshiper — is the glue that binds the two distinctive fields of entertainment into one. He proudly dresses in Cubs garb, encourages players before play, and joins the massive crowd (via press box) as they anxiously watch their bat-swinging troops march them toward the Promise Land. Concert footage of his music at Wrigley Field is resourcefully used as the “official” soundtrack for the highs and lows (but mostly highs) of the team on the ball field as the fervor reaches heights beyond anyone’s belief. Predictably, Pearl Jam indulges the maniacal masses with some of their classic hits that include “Jeremy,” “Better Man,” “Black,” “Corduroy” and “Elderly Woman Behind The Counter In A Small Town.” The mixture of the two is undeniably inspiring. 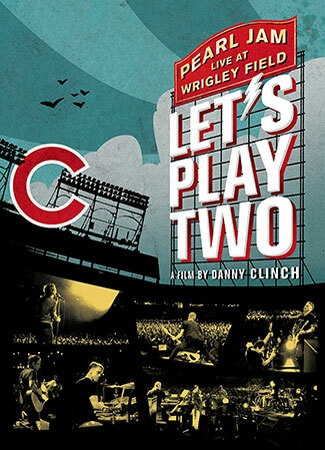 Again, although its feel-good moments, Pearl Jam: Let’s Play Two will bring nothing exploratory or particularly fresh within the realm of concert film documentaries to indifferent outsiders that do not harbor any allegiance to either Pearl Jam or The Chicago Cubs. For those faithful insiders that love to soak up Cubs folklore — Murphy’s Bleachers Bar, decade dogs, the team’s mythology of a century of misfortune — they most certainly will not mind the familiarity or positive/negative reminiscences because this film will reinforce their loyalty to the Cubs (in victory and defeat). As for Chicago’s homegrown local boy Eddie Vedder, his decision to return to his treasured turf to lovingly engage Chicago’s other well-known attraction and document it is a laudable one. Hopefully for his sake, he won’t have to wait another lifetime to display his affections again (the Cubs did not follow-up their 2016 World Series win).